The liturgical life of our Orthodox Christian Faith is meant to be full of life, engaging, and reflecting Christ’s commission to his apostles to “Go and baptize all nations….” This is not a passive command, but an active one, which we are called to accept as our own. To aid us in our efforts, the church provides us with the liturgical arts: icons, which adorn the walls of our churches, providing visual instruction about the life and teachings of Jesus Christ, and the hymns which we sing, expounding on the same events as portrayed in the icons. As windows into the Kingdom, iconography and hymnography reveal the glory and majesty of God. Whether used independently of each other or together, icons and hymns enable our relationship with God to deepen, making the feasts and saints present for us today. The saving message of Christ as found in the life of the church is for all of us to accept and adopt as our own. For Orthodox Christian parents, who also have the responsibility of raising their children in the Faith, they must establish a firm foundation for their children to develop their own relationship with God the Father. Our kids are constantly bombarded by visual and auditory messages in society – many which contradict the teachings of the church – and children need a firm foundation rooted in the love of God, to understand right from wrong, and discern what will benefit their relationship with Christ and His holy church. It is critical that the hymns and icons of the church have a place in the lives of children, as a guide for their growth and development. 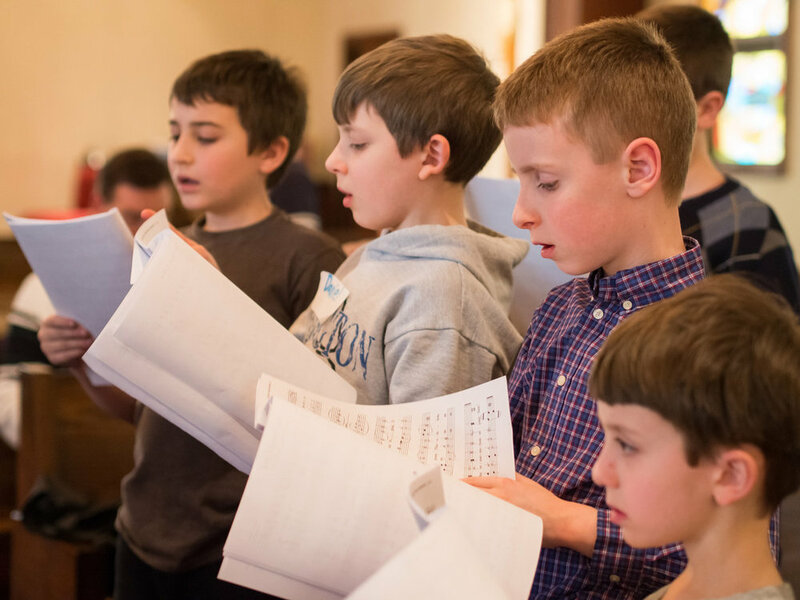 To help children understand the importance and usefulness of the liturgical arts – and singing in particular – a series of workshops has been established by the Diocesan Liturgical Music Commission for the Diocese of New York & New Jersey with the blessing of His Grace, Bishop Michael. These workshops provide an opportunity for children to discover the basics of music theory, examples of liturgical music, and inspire kids of all ages to take a more active role in the life of the church through liturgical music, glorifying God. The day-long workshops are structured to be fun for the children, stressing the importance and beauty of singing while in church and at home. A selection of hymns shared with the kids and their parents make it possible to bring the liturgical arts into their homes. We may have icons in our homes, but do we also sing the hymns of the church year at home? Parents can encourage kids by having their families say morning and evening prayers together, or by singing the Lord’s Prayer or the festal apolytikion (or troparion) before meals. Even if it’s not the most harmonious experience, it can be an expression of a family’s love for and relationship with God. The importance of making these moments enjoyable as well as educational for the children cannot be overemphasized. The “fun” which is possible when sharing the happiness of Christianity makes me think of the evening hymn “Gladsome Light” – or as translated by others –“O joyous Light!” Christ is the Light of the world, and we want the children to experience the joy of encountering Christ through liturgical music, so they will continue to develop and raise their voices to God throughout their lives. The diocesan workshops are done prayerfully and for the glory of God, in hopes of increasing the number of singers, readers, directors, poets, composers and educators to lead the next generation of faithful in singing praises to God. Participation in the workshops is open to kids from ages five to fifteen, regardless of their musical background or ability. The format of the workshop is designed to allow those with no previous musical training to learn about music in a welcoming and engaging environment, not only from the instructor, but also from their peers. Since the children may be coming from different parishes within a particular deanery or across the diocese, the workshops also provide an opportunity to get to know one another, and possibly establish friendships with other Orthodox kids which hopefully will extend beyond the day’s events. Much like the family portraits or photos on the walls of their homes, the presence of icons reminds the children of always being surrounded by the saints, our guardian angels, and the Theotokos. For this reason, the workshops are held in the church, usually in front of the iconostasis, to create a setting where the children are surrounded by Christ and His saints. The icons also play prominently in the topics presented during the workshop, providing real examples of making Christ present in our lives and introducing the liturgical arts to the children. Invariably, kids have already learned any number of songs – from nursery rhymes at home or in day care programs, to songs they hear on the radio, or those taught in school. The goal is to help the children realize music is all around them, and the church hymns can also be theirs to sing. Troparia are liturgical “theme songs” which serve as great starting points to introduce children to church music, because they encapsulate core theological topics, lend themselves musically for the kids to learn, and are relatively short and memorable. Depending on the time of the year, the workshop will use the festal troparia (apolytikia), kontakia, and hymns for upcoming feasts. These hymns represent the most important feasts and celebrations of the church, and time is set aside during the workshop to ensure the meaning and message of each hymn is outlined and explained. To accomplish this, the workshop makes use of the festal icons adorning the walls of the church. Keeping the atmosphere of the workshop informal and engaging, a scavenger hunt begins, where everyone is sent to find the icon which best represent the text of the hymn which is read by one of the children. The purpose of this activity is twofold – it allows the children to look more closely at the icons which adorn the walls of the church, and to enable them to become more comfortable in God’s house. Like the hymns we sing, the icons which surround us are not static or passive, but meant to be engaging and bring us closer to God. The results of the search may vary and certainly can be interesting. Some kids immediately find the correct icon, while others suggest icons which may have similar themes or elements (a mandorla around Christ, the correct figures, it looks familiar, etc.). Each child is asked to compare the icon they’ve selected with the text of the hymn, to see if they can determine the right answer on their own. Do the icon and hymn match? Or are they related? Invariably, those with the wrong guess will continue their search, while those who found the correct feast, will be able to confirm how it is the right icon. When the majority of the children find the correct icon, we gather around it and discuss what they see in the image, what is being portrayed, and how this relates to us as Orthodox Christians. We then collectively refer back to the text of the hymn and read it, comparing it to the icon before us, to see if they match and how they relate to each other. Some of the icons and hymns match words with images – like the icon of our Lord’s Nativity and its festal kontakion. In this way, the kids discover that these words and images have meaning for us – in other words, there’s a reason why we celebrate these feasts, and how Christ becomes real in our life – and how His actions enable us to obtain salvation. Throughout the workshop, the kids are encouraged to get involved, either by answering questions, helping others to sing, or volunteering to read the texts. This provides them with an opportunity to share what they know, and to become comfortable with speaking in church. In this way, they experience reading in church – which can strengthen confidence and identify potential readers for services. Children who attend the workshop receive copies of the hymns to potentially sing in their homes, making the feasts more present in their lives. What frequently is misunderstood to be done “only in church” can be extended beyond the doors of the church and be used in the homes of believers, making the feasts of the church real in our daily lives. For example, these hymns may be sung before meals or going to bed, or with morning prayers. Even at three years old, she understood what she was singing. Each year since, she begins asking in the middle of Great Lent when we can start singing her favorite song again: “Christ is risen!” She, and our older daughter, now looks forward to singing all of the different settings of the Paschal troparion they know and love to sing. They have adopted these hymns as their own, because they sing them before meals and bedtime, and enjoy singing them as often as they can during the Paschal season. This situation helped me understand the importance of making these hymns “our own,” so the kids at the workshops are encouraged to have that same desire and excitement. We look at the Resurrection icon – both before and after singing the Paschal troparion – to see what can be discovered in the image and what is depicted. It’s amazing to see how perceptions changes when the kids look at the icon. They see the deeper meaning, and relationship between the hymn and what is being depicted in lines and colors. They identify Christ in the icon, and how he is literally raising Adam and Eve from the tombs. Since most kids won’t be able to name each of the Old Testament figures in the icon, this becomes a talking point to explain how the prophets foretold the coming of a Messiah who would save His people. It also provides an opportunity to explain how Christ’s resurrection is also a victory for us, and makes our own salvation possible. The workshop also presents a basic overview of music theory and western notation. Using an oversized poster board, the kids make music, constructing the first two measures of the hymn, and begin to see the relationship between each of the elements: “this A relates to that B-flat, and it’s a quarter note, so we sing it like this, because….” Like the lines and colors used to create an icon, the musical notation becomes the method by which the message of the liturgical texts is proclaimed. Form follows function and guides our efforts to immerse the children in music. The practical exercise of putting the notes on the board and assigning the notes to words is a tangible learning moment to explain how those who sing take the notes and text and put them together. The music becomes the language which we use to proclaim our beliefs and glorify God, just as the board, brushes, and paint are used to create the icons which visually represent what we believe. It’s very important to be honest with kids since they pay attention to what we say and what we promise we’ll do. And they learn better in an honest and loving environment. The support given by His Grace, Bishop Michael of New York and New Jersey, is visible by his attending at least a portion of each workshop thus far held within his diocese. He offers words of encouragement to the kids, and his commitment to educating our youth is very apparent. It is inspiring to see the reaction of the kids when His Grace talks with each of them one-on-one, and they reciprocate and want to sing for him, to show what they have learned. The venerable archpriest and composer, Father Sergei Glagolev (born 1927, Gary, Indiana) said, “If you want to know what the church teaches, come to church and listen to what we sing!” The stichera, troparia, and irmoi which we sing or hear in church confirm this idea, as they recount the events of Christ’s earthly ministry and teachings. The lives of the Theotokos and the saints are also found in the sacred hymns and provide examples and inspiration for us to abide by the teachings of the church. I believe it is critical for the education of children is to see the divine services as active and not passive experiences, and the hymns and icons help make that a reality. This is also critical for parents to understand, as the liturgical services of the church are there as a means to help each of us draw closer to God. By singing the responses in church, or singing/reciting the texts at home, the feasts become a part of each of our lives and our shared experience in the church. We live in a world which stresses the importance of communication, with new technology enabling us to stay connected with each other. If we as Orthodox Christians want to raise our children in the Faith, then we need to also make use of the timeless resource of the church – icons and hymns, prayer and fasting – to aid our efforts to strengthen the connection our kids have with the church. The icons we venerate in church and at home allow God to be a part of our families, and the hymns we sing express our love for Christ and His holy church. We need to pray to God, asking Him to send the Holy Spirit to guide our labors, especially in the lives of our children. And, if we have faith in God, He may bless our collective efforts, inspire others to join us, and possibly establish a new period of “glory days” for our parish choirs for the glory of His Name. 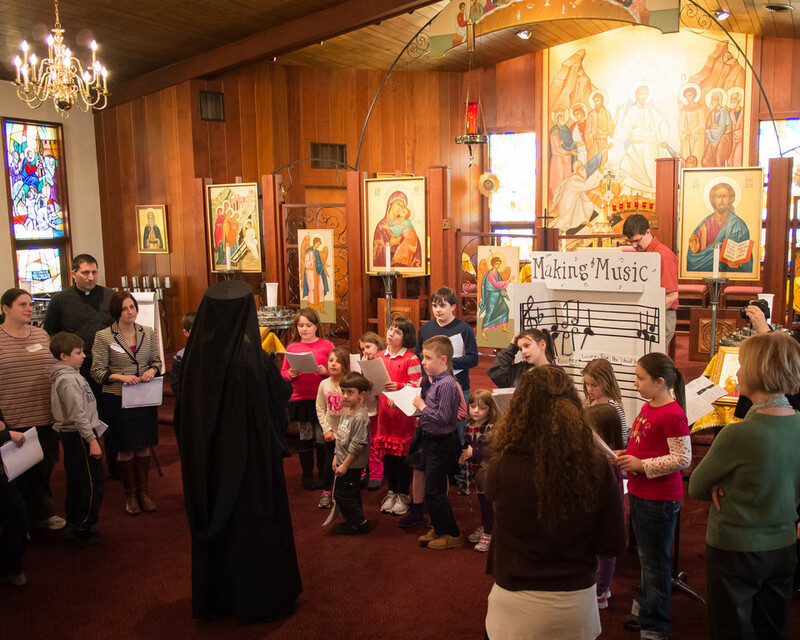 David Lucs, a member of Holy Protection Cathedral, New York, NY is an Orthodox choir director and composer, who has led Childrens’ Music Workshops in OCA parishes over the past two years. He also presented a paper about the workshops at the fifth music conference hosted by the International Society for Orthodox Church Music in June 2013, in Joensuu, Finland. David (dlucs@verizon.net) is available for future workshops and parishes are invited to contact him to schedule workshops in their communities.